If you love the way Peter Lynch invests, then you'll probably love this trio of stocks. Peter Lynch rose to fame managing one of Fidelity's largest mutual funds. However, one of the biggest things he's done for investors isn't putting up great performance numbers as a mutual fund manager -- it's writing about the core beliefs that drive his investments. And one of the keys is buying what you know. On that score, internet giant Alphabet (NASDAQ:GOOG) (NASDAQ:GOOGL), low-price retailer Dollar General (NYSE:DG), and food behemoth General Mills (NYSE:GIS) all look like stocks that Peter Lynch followers would love today. Here's why. Brian Stoffel (Alphabet): One of Lynch's most famous dictums was to "buy what you know." Given that you're an internet user reading this piece, the probability is exceedingly high that you're already familiar with Alphabet, the company formerly known as Google. Already, Google has eight different products with over 1 billion users: Search, Maps, Gmail, Google Play Store, Google Drive, Chrome, Android, and YouTube. While most of these services are offered for free, you're giving something critical away in the process of using them: your data. Alphabet can turn around and use that data to offer up some of the best advertising placement in the world. During the first nine months of the year, this advertising business accounted for 87% of the company's $78 billion in revenue. For a novice investor -- which is who Lynch targeted with his famous books -- it's not important to understand every single machination of this advertising machine. Monitoring your own internet-using habits can tell you a lot. Do you still search with Google? Do you often visit YouTube? Are such visits increasing or decreasing in frequency? Without these visits, Google doesn't get its data. Without the data, its advertising revenue will likely drop. That's important information. And with Alphabet -- and other tech giants -- having fallen so much in the past month or so, now's as good a time as any to add shares to your portfolio. Keith Speights (Dollar General): I'll jump in with another great example of Lynch's "buy what you know" strategy. Discount retailer Dollar General operates more than 15,000 stores in 44 states. If you live in a small to midsize community, there's a good chance that a Dollar General store is nearby. While Amazon's growth hurts some retailers, Dollar General continues to prosper. A major reason for this is the company's focus on inexpensive products that people tend to want quickly. Dollar General's convenient locations -- with some stores only a few miles apart -- also has helped the company survive and thrive in a retail market that has increasingly shifted to online purchases. Lynch is also famous for his idea of buying growth at a reasonable price. Dollar General checks off that box, too. Its shares currently trade at around 15 times earnings. Wall Street analysts project that the company will increase earnings by roughly 14% annually over the next five years. Dollar General CEO Todd Vasos stated in September that his company plans to generate growth in several ways. The most obvious of these is to open more stores, with 975 new stores planned for 2019. But Dollar General intends to boost sales in existing stores by installing more cooler doors and revamping its checkout lines. Vasos said that "these types of projects drive high returns by encouraging our customers to make more trips and increase their basket sizes." Spurring growth in a relatively inexpensive way? Lynch would probably smile. Check out the latest Dollar General earnings call transcript. Reuben Gregg Brewer (General Mills): You eat food and will keep doing so until you are on the wrong side of the grass. Walk into any grocery store and you'll see food giant General Mills' products on prominent display. You probably have some of its iconic brands in your kitchen right now. The list includes Cheerios, Yoplait, Haagen Dazs, and many, many more. General Mills easily fits Lynch's "buy what you know" mentality. But it's not a growth company. It's a century-plus-old giant that's temporarily out of step with customers. It has been here before and is making the changes needed to adjust, including buying brands that offer trendy products (like natural brands Annies and Blue Buffalo pet food) and introducing updated versions of its core products (such as Yoplait's new high-end Oui). It's making progress, going from share gains in just two of its nine core categories in fiscal 2017 to six of nine in the first half of fiscal 2019. It's also enacted a major turnaround in its yogurt business. Clearly, General Mills is doing something right. The problem right now is leverage. The recent Blue Buffalo acquisition increased debt by 48% year over year in the second quarter. That's a big uptick, leaving long-term debt at roughly two-thirds of the capital structure. However, the company covered interest expense in the quarter by more than four times, so it appears capable of handling the extra interest costs. And while it is currently focused on integrating Blue Buffalo, the next step is likely to be debt reduction via the sale of non-core assets or underperforming brands (long-term debt fell by roughly $450 million through the fiscal first half, by the way). 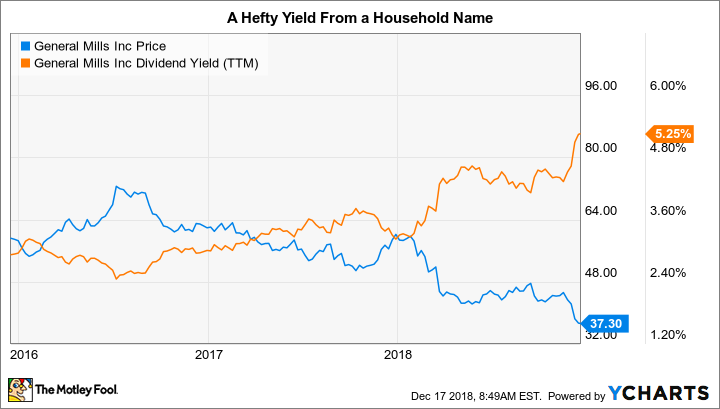 You'll need to keep an eye on General Mills' balance sheet, but the hefty 5%-plus yield is probably worth the effort. Check out the latest General Mills earnings call transcript.